The history of our fire brigade The first piece information about a fire protection system and the fire brigade itself is found in a notice from a meeting of our local authorities from May,15 1894. They describe as follows, "...............we declare to introduce a kind of tax for dogs of 3 Marks per dog....... and the money should be used to buy a new fire engine." This event has to be seen as the beginning of regular fire service in the village of Gladitz. The founding of the fire brigade took place on June 16, 1933. During the following years the equipment of the fire brigade was improved systematically. The technical equipment at this time was: 1 fire engine with an output of 400 litres per minute (about 105 gallons) 2 transportable ladders 12 m of suction pipe (about 13 yards) 8 m of rubber fire hose (about 8.75 yards) 300 m of non-rubber fire hose (about 328 yards) 10 gas-masks 15 uniforms In 1939, World War II started. Most of the men were called up into military service. The existence of the fire brigade was a bit in danger because of this. It was the merit of fire chief Karl Schramm that the basic structure of the fire brigade of Gladitz was kept over during wartime. After the war, everything necessary to provide a regular and useful fire protection was lacking. Only from 1951 did the fire brigade start to play a more active part again. After an absolute low, caused by the migration of many young people at the beginning of the 1960s, a reconstruction of the fire brigade was started in 1970 under the leadership of chief Otto Berk. Today our fire brigade is stationed in the building that used to be our school. Nearby is the garage for our small "fire truck type Barkas B1000". The number of members was reduced during the last years by migration. The members spend less time on their "hobby" because of being intensely committed into their jobs. Members: 14 Chief Otto Berk started a teen fire brigade because of his enthusiasm to develop interests of children and teenagers on the importance of fire protection. 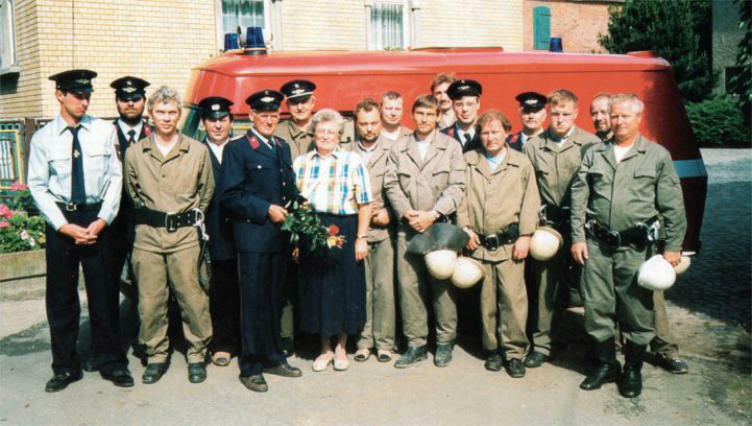 After his retirement Gerd Heier continued the leadership of this "special kind of fire brigade" and is still leading 12 children with great success. For more information see our brochure mentioned in "Publications".